IDC predicts that by 2020, 40% of commerce transactions will be enabled by conversational AI solutions. 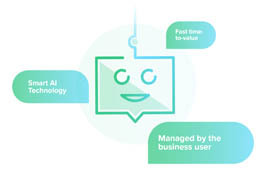 But what is conversational AI, and with so many solutions out there, how do you choose one that’s right for your business? Take a dive into the world of chatbots and discover why most solutions out there are either too simple or too complex, and learn how to spot one that’s just right for your customer engagement.